This is the magical view across the water from St Marks Square in Venice. We can see the Isola Di San Giorgio Maggiore shimmering in the Mediterranean sunshine. Tags: card, Cityscape, greetings card, Italy, Mediterranean, Venice. 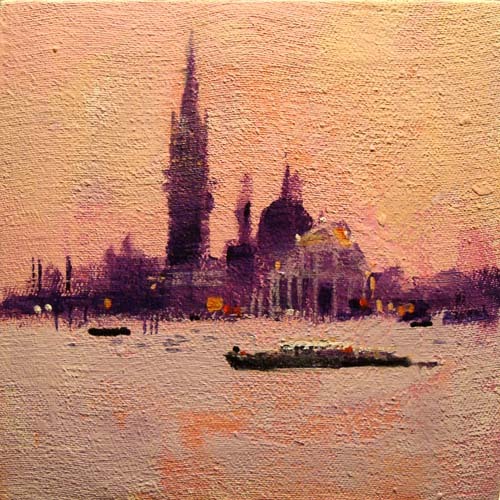 VENICE – VIEW ONE is a greetings card featuring iconic views of Venice. Colin Ruffell is the artist and he signs every card by hand . The card can be framed and kept as an art piece because the picture is printed using fine-art paper and lightfast inks. The cards are blank inside for your personal message, besides that every package includes a white envelope. “This is one of the worldwide cityscape pictures from my portfolio of giclee fine-art prints. Visiting famous places is one of the most fascinating things that I have ever done. Of course I am lucky because I was born in London which is crammed with iconic venues. But over the years I have visited, and painted, lots of other wonderful places, all over the world. For landscapes and cityscapes I go and see the place if possible. I make sketches or a plein-air painting, take photos, and gather background information, before I bring these back to my studio here in Brighton UK. Or I digitally develop ideas for paintings, or just experiment with a blank canvas.